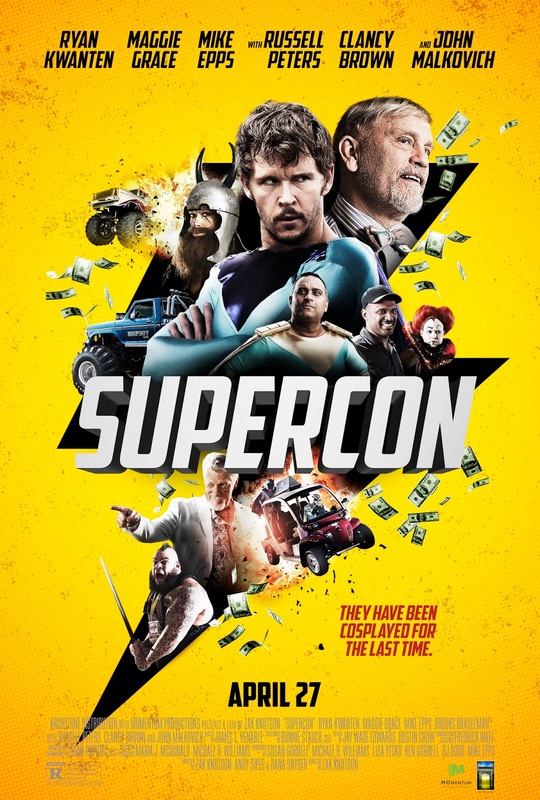 A comic book convention caper comedy, about a team of small-time celebrities who decide to rob the convention they worked at. It stars Ryan Kwanten, Maggie Grace, Russell Peters, Clancy Brown, Mike Epps and John Malkovich. It was directed by Zak Knutson, and written by Knutson, Andrew Sipes and Dana Snyder. The movie has gotten mostly negative reviews from critics, and fans, but I found it to be mildly amusing. Adam King (Brown) is a former TV icon who still makes a lot of money touring comic book conventions, with the help of a corrupt promoter named Gil Bartell (Epps). A group of comic book artists, and other smaller TV stars, get into a fight with King one day, and they're all fired because of it. 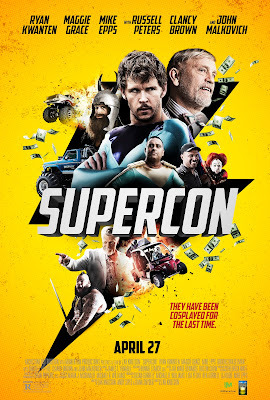 Matt Wheeler (Kwanten) comes up with a plan to rob Bartell and King, by stealing the money they make from the convention. The team of misfits recruit another former TV icon, Sid Newberry (Malkovich), to help them. The film has some colorful visuals, and a nice cast. I really liked seeing Kwanten and Grace together, after just seeing the duo in 'THE HURRICANE HEIST'earlier this year, and they're both good in both films. Of course the veterans are the scene stealers (Brown, Malkovich and Epps), and the movie definitely has a few good laughs. For me it was worth watching at least, and I think it's a heck of a lot better than it's IMDB and Rotten Tomatoes ratings! It's of course nothing great or special though.